I purchased this product earlier this week. Read to find out what I thought of it. Product Description: Frozen fish sticks from the Gorton's frozen fish brand. 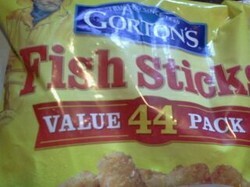 I purchased a bag of 44 fish sticks for $6.70 while out shopping at one of our local grocery stores earlier this week. I ended up making some of those fish sticks in our conventional oven as part of a family fish dinner Tuesday evening. As I mentioned in an earlier review, I was in the mood for fish earlier this week and, because of that, stopped by one of our local grocery stores before work to pick some up. While doing this, I realized I should pick out something I knew my children would be sure to eat (they both are a bit picky, especially in the evening, when they are getting tired out) and ended up buying a bag of Gorton's Fish Sticks. Even though my overall selection of fish at this particular store was limited, I did have about four different fish stick brands to choose from. The Gorton's brand wasn't the least expensive of these brands. However, I ended up making this purchase anyway because I've had good experiences with this brand in the past. And, as it turns out, it was a good decision. 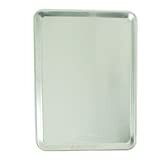 One thing, in particular, I found I liked about this product right away was the quantity. As I said, this wasn't the least expensive brand I had to choose from. But, I did think the fact there were 44 fish sticks in the bag (the other brands only came in small boxes) helped improve the value. And, it was nice being able to prepare as many as we needed for dinner and still have plenty left in the bag for a future use, especially since fish sticks are relatively popular in our house. I prepared these in our conventional oven and they baked up exactly the way we prefer them to. The breading was brown and crisp (without being overcooked) and, unlike many other brands we've purchased, the fish sticks didn't leave our pan extremely greasy. As far as taste goes, these were pretty much what I was expecting from this brand. The fish sticks (both the breading and the fish itself) had a good flavor to them. They weren't bland-tasting (like many brands) or over seasoned (like some other brands) and everyone enjoyed them as a result. In fact, both of my daughters ended up having seconds, something that doesn't happen very often and is proof they both approved of my purchase. This brand is a bit more expensive than some of the other brands you might have to choose from. However, the overall quality does make them worth spending the extra money. This product is something my wife and I will purchase when looking for a dinner for two. Read to find out why.